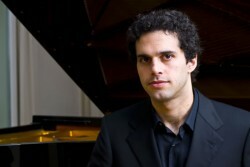 World-renowned pianist Soheil Nasseri to perform benefit concert for former child soldiers. Nasseri will play Rachmaninoff and Beethoven for the Grassroots Reconciliation Group to aid former child soldiers in northern Uganda. Reception with drinks to follow. 100% of proceeds will go directly to projects to benefit former child soldiers in northern Uganda through the Grassroots Reconciliation Group, a 501(c) nonprofit organization. See all of tonight’s and the week’s events here. To add your event, click the events tab up top and then click “add an event”. You can add concerts, museum/gallery exhibits, fundraisers, sporting events, bike rides etc. You can add anything you think will be of interest to PoPville.